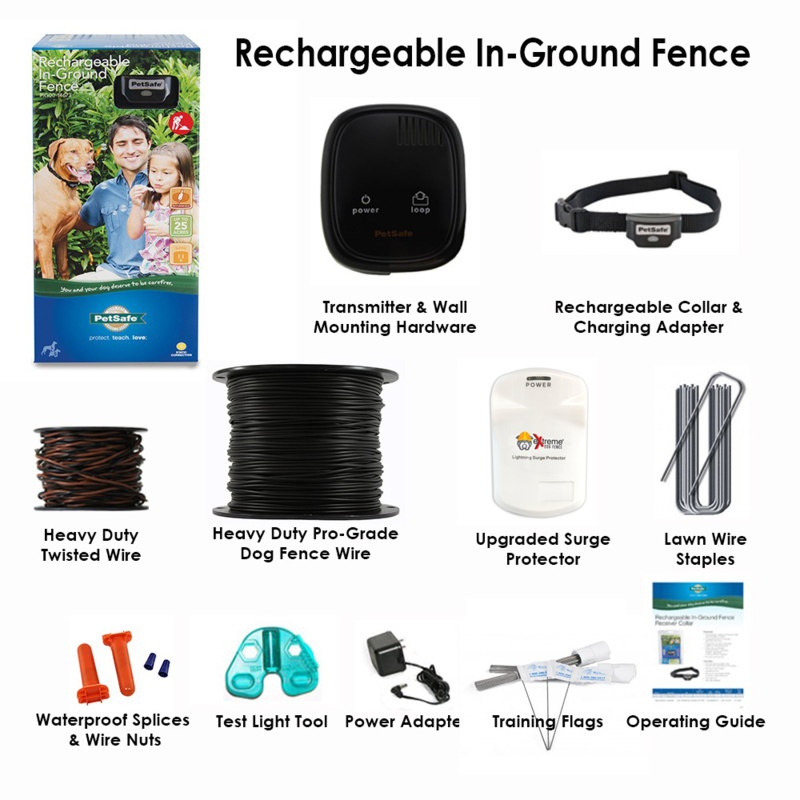 PetSafe | Rechargeable In-Ground Dog Fence - Pro-Grade Upgrades! The PetSafe Rechargeable In-Ground Fence introduces a rechargeable and versatile collar to the PetSafe In-Ground series of dog fences. The small, lightweight collar is suitable for dogs from 10-150 lbs. and features quick charge technology. This system is a good alternative to the YardMax if price is a concern. 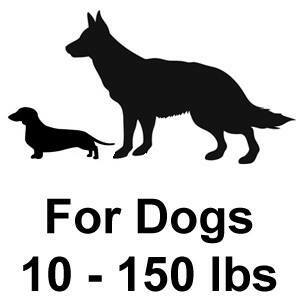 It's also perfect for those multi-dog households with a dog under 10 lbs. because this system is compatible with the other PetSafe In-Ground Fence series collars, like the Elite Little Dog. The Rechargeable In-Ground Fence is also compatible with PetSafe Indoor Pet Barrier, model: PIRF-100. Collar Receiver Box: 2.36" x 1.54" x 1.38", 3.2 oz. Collar Strap: 3/4", fits necks 6"-26"
The rechargeable PetSafe fence is a great buy, and reliable system. The PetSafe rechargeable fence system is a great basic fence system, but we liked that fact that the collars are rechargeable. I don't want to have to go out and pick up batteries every time they get low. This way, we can just throw the collars on the charger for a few hours and we're back to "up and running". We went with the professional grade version of the fence. The fact that the wire will last 20 years was selling point enough. Not to mention the longer warranty and all the other niceties that come with the pro grade package. Very happy with our purchase, and would do it again. The PetSafe rechargeable fence is a good quality system. We're pretty happy with it. PetSafe has got an excellent fence system, if you like the idea of a rechargeable collar. That was a feature that was important in our decision making. We have had battery run systems before, but the battery was difficult to find, and there were times we'd be waiting on the replacement battery to arrive and couldn't let the dog out back until it did. We like the PetSafe name, as we've used their products before. The rechargeable system we got will work with lots of the other PetSafe in-ground fence systems. We may be getting a family member's chihuahua, and add her to the fence. Luckily, I can get an Elite Little Dog collar for her. The installation was painless, and so was the training. It's amazing how well these fences work. I thought they would be something that would hurt the dog, but it's not really like a livestock electric fence. We're really happy with the system and would recommend it. Rechargeable is the way to go. I think that this dog fence system is great. I like that the collar is rechargeable. It allows me to charge the collars and not have to buy batteries every couple weeks. This helps me save money and I am all for this. The dog fence has made a large impact in regards to keeping my dogs secure. I have only positive things to say about purchasing a dog fence system. The staff has made buying a dog fence system extremely easy. The FlexPetz site is very informative and helpful. It was a tremendous help with the installation of my dog fence system. Another positive aspect of the website is there are many videos which help you gain a better understanding of how these dog fence systems work and what to look for when making a purchase. Thank you FlexPetz for all the advice and support. The Petsafe Rechargeable fence is less than half of what it would have cost to have a fence installed. Most company installed fence systems seem to be upward of $2000 or more, and I'd just as soon put up a metal fence, than pay that kind of money for an invisible type of shocker fence. I can't believe how much money those guys make doing installs. I'm definitely in the wrong line of work. I found Flexpetz' website online, and contacted Mark or Mike there. He really knows his stuff. He helped me find a fence, with a rechargeable collar, for less than $400. A second collar and I was still under the $500 price tag. Needless to say, this is WAY better than paying $2000+ for someone to do the setup for me. I ended up speaking to the same gentleman, again, when I needed some creative assistance with my wire layout. I couldn't easily navigate some structures in the yard, so he showed me a double loop wire layout and we knocked it out of the park. I'm really surprised by the level of service that Flexpetz gives their ding dong customers. I will definitely patronize their store again, for my future pet item needs. This is a fantastic dog fence system. While searching for a in-ground wired system I came across the Flexpetz website. I have been searching online for a wired dog fence that has rechargeable collars. After comparing different systems I found this dog fence system. The reason I feel this system is great is because I can recharge the collars. Over the long run I will save money by not having to purchase batteries. I am impressed that the battery life is very long before it is time to recharge the collars. The entire system is high quality. I remove the collars at night and charge them. The next morning I then place the collar on my dog. Thank you FlexPetz for the recommendation of this great dog fence system. The PetSafe Rechargeable In-Ground Dog Fence is Great. I have searched the web looking for a in-ground dog fence and found this on the FlexPetz website. I think this is one of the best products out there for dog fences. I have multiple houses and use these dog systems for each one. I have tried different systems over the years and this dog fence by far is the top investment I have made for my dogs. I must admit that I love dogs and dog fences are the best way to give my dogs the freedom to run around the entire property. The rechargeable collar feature makes this system well worth every penny. I save money by not having to buy replacement batteries. Two thumbs up for this dog fence system. Thanks FlexPetz. This would have been all 5 stars but I have 4 dogs so the system did get very pricey. I chose to go with one of the professional systems as well since I am doing 3 acres and only want to install this one time. I agree with a previous review as the collars are fairly small and probably not suited for dogs up to 150 lbs. The people at flexpetz were helpful though and got me into a system that works well for me. The PetSafe systems seem like a great product as well compared to others I checked out and the wire with these systems is definitely a lot more substantial than what normally comes with them. While I complain about the price I think it was definitely worth it and much cheaper than building a physical fence. I am pretty impressed and happy with the PetSafe Rechargeable Pro fence. The installation on a Pro Grade dog fence is very easy to do. The wire gets laid out and connected to the transmitter (which is in the garage). Then you test, walking the fence with the collar and test tool. When everything is working and tested, you bury the wire and incorporate the surge protector. For a small yard, the wire burying only took a little over an hour and then a watering of the buried wire (for good measure). There is nothing very technical about the setup. Even setting the range of the correcting zone was easy enough for a newbie to do. I don't know if the other Pro Grade PetSafe fences are as easy to work with, but I would sure recommend the Rechargeable system to the common person dog owner. Training has just started, but seems to be pretty easy too. Definitely worth the price. Much cheaper than a professional installation and gives the user the control to make any needed adjustments. This rechargeable fence by Petsafe Pro Grade is a pretty good setup. I'm no stranger to fences like those by Invisible Fence. I never had too much problem with one of their systems, and if it weren't for the exorbitant costs associated with it, I would possibly remain their customer for as long as I needed a wired fence system. The Petsafe Pro Grade brand rechargeable fence is very similar in quality and function, but the price tag is a lot smaller. I like a good bargain, so I gave it a shot. So far, I'm pretty happy with the money I've put out. The wire is about the same or a little better than Invisible Fence systems run on. The really good thing is that the power to make adjustments and changes is put in the customer's hands. I do like not having to rely on a company to make any needed changes or do any coverage expansions I may need if I get more land. I won't give 5 stars, because I haven't had the system for long and don't know if it's going to keep performing the way it does now. However, if someone asked today, I would say it's a good investment. This dog fence is a great investment. It has taken some time to discover the ease of dog fences. Thanks to an informative neighbor I have purchased a dog fence for my two dogs. This dog fence gives my dogs much more exercise. I feel rest assured that my dogs are in a containment area that keeps them safe. These fences are very effective. I have had no problems with the fence. It was easy to install and the customer support was great. Thank you. I just purchased this system as a last ditch effort to keep my pups on my 10 acre property. You would think 10 acres full of trees would be enough for 3 lab mix mutts but they would hear other dogs barking on other properties and dig under my fence to go check them out. After a bunch of complaints from my neighbors and the final straw of a citation from the city and spending 2 years trying to find ways to stop their digging I finally decided to give one of these systems a chance. My main concern going into this was how much area I needed to cover. My entire 10 acre property is already fenced. I just needed my dogs to respect the fence. Could I realistically run 3,000 feet of this wire and it would actually work? I bought the Petsafe kit and 2,500 extra feet of high grade wire. I did not want to bury it. As you can imagine that would have been quite the undertaking. So instead I attached it through my field fence about 8 – 10 inches or so off the ground. It still took forever to complete but sure beat digging up tree roots as my fence line is covered with trees. I had the help of my 12 year old son to help with putting it up. I used zip ties to attach it to the fence and did not make it to difficult of a task to complete. The only place I buried the wire was across the front part of my property. I did not want the wire visible across the front wooden decorative fence plus I have a concrete driveway that I was going to have to go under anyway. I rented a concrete saw and cut a line across my driveway to bury the wire. After 2 weekends I finally had all the wire run. I was certain when I plugged this thing in that I would find that I had a break or bad connection somewhere and the troubleshooting would begin. However much to my surprise the system worked fine. We trained our dogs as per the instructions (it was much easier for us since we had a real fence and did not use the flags at all). It only took 1 day for my dogs to realize that they should not go within 5 feet of the fence. After a few months I decided to try leaving my driveway gate open. Happily, I found that the dogs would not go near the gate even when it was open. I did not even have to train them, they were just already used to staying clear of the fence. The collars are a bit of a pain to put on the dogs each morning. Our dogs sleep in a kennel each night so we remove the collars at bed time and put them back on in the morning. Also I am noticing that the place where the collars strap attaches to the receiver is starting to break. My dogs like to play a lot with each other and I think they are putting extra strain on the collars daily with their roughhousing. So far the collars have not broken but I expect they will in the not too distant future. Due to this I came back onto flexpetz and bought a bunch of their lupine collars and waiting for them to arrive. I bought this product back in April of 2014 so it has been almost 1 year that I have had it. While I hope future collars will be a bit better built I must say that I highly recommend this product. I spent some time looking for the right fence and also had Invisible fence come out to give me an estimate. They were not very happy with me when I had something to say about their estimate. I did try to bargain and they didn't like that either. So I did some homework and looked up everything from real fences to the wireless fences. I did not like the cost and ugliness of the real fences and I was made aware that a wireless fence would be pretty useless for me if I lived on a slope. and had a lot of trees in my yard. Well I did not certainly want something that would leave me with doubts, then what is the point. I came across this site in my search and I was able to speak with someone who could talk to me a little more in depth about what would work best for me. I liked the personalization that was fitted for me and all the wonderful attention i received from the tech on the other end. He spent close to an hour and a half with me talking about different ideas and mapping out my yard to ensure I received exactly what I needed. The time spent with me and the customization of my order made it feel like this was just as important to him as it was me. I liked that. So after all of the talking and working out what would be best, I was scared to hear the cost of what I ordered. As I cringed before he gave me the price (thinking it would be close to $1,500) I was told it would only come to just under $700. I was astonished and very pleased with the price. I was also made aware that I had customer service for life and if I needed anything or had any issues to just call them back and they will do everything they can to ensure I am happy with my purchase. Well I just got off the phone with Johnny who was very helpful in my confusion and was glad to help me out with something as simple as resetting my collar. I was not asked to pay like my poor girlfriend who has to pay a silly amount for help with Invisible fence. I really like the customer support and the guys are easy to talk to. My system has been a really big help and have not had much of any issues with it, besides my stupidity and It works really well. I did have to train my dog and that was to be expected. Once again I am very happy with my purchase and will recommend this company to all of my family and friends with pets. It has really helped me save much more then I even anticipated and was a pretty easy installation process. If you get to talk to Johnny, he is a character and makes you laugh, making everything so much easier. Thank you Johnny! Pretty nice so far, but holding off full review until a few months more. I don't want to get too happy, too quickly, and have something go wrong. I haven't even had this Petsafe rechargeable fence pro grade for 3 weeks. So far, I'm surprisingly happy with it. I own less than 2 acres of yard, so my setup is not a difficult one. I didn't bury the wire. I may be moving within a year, so my choice was that I'd be better off with the upgraded extreme wire. That way I could do the above ground installation and easily take my wire with me when I move. The directions were easy enough to follow, and I'm pretty happy with the results, so far. If it keeps working as it does now, I'll be a very happy man. The price is really affordable. I priced around and found flexpetz to be quite reasonable for what I wanted. I'll definitely be looking forward to continued success. I thought I would write a review about this system because it took me about three weeks to think about purchasing it and why I needed this one. I could not fathom that here in Florida would need some professional grade system but I wanted to sit on it to ensure it was not what I wanted because of the standard systems. I wanted something that would last but being a single mom, I did not want to spend that kind of money. I have 2 dogs and three kids and widowed. I had to also consider the fact that I would have to install this system myself. I almost purchased the standard system all because it looked simpler then the professional grade. I researched and pondered and researched and pondered... then I called because no matter what one I decided to go with I did not know how I would lay it out, how much I needed or much of anything. I contacted a Tech and he helped me with the layout of what I should do with considering all of my wants and un-wants in placement. He sent pe pictures and layouts and ideas and spent a good amount of time with me going over everything. I asked about the differences between the pro and standard and it all made complete sense. I ended up making a decision after pondering all of the data and chat and notes from the tech, called back and ordered my system. The Tech did not call me back because I asked him to let me call him when I am ready (I hate pressure from sales people). When I called back he was ready to help me and answered more of my questions and did not push me to purchase still. I made the choice to purchase and he was very accommodating and let me know what each part was for and basically what each parts specialized function was. I have to say I probably took up about Four hours of this guys time and he was so patient with me and did not push me at all in the process. I wish I could find this kind of service everywhere and I wish there was millions of people like this with this much patience. I feel very respected and taken care of. My shipment came in a week ago and it was not a heavy process to install. I had a little hiccup ( question) and called and he was right there with me to walk me through a simple step that I felt so stupid about. No questions asked, RIGHT THERE TO HELP! I had already taken so much of this guys time and made my purchase, but he was very happy to help! WOW! I am highly impressed with this company and how I was treated that I had to come on here and tell it to the world. I feel I made a great decision because the system was top notch and I am very pleased with every bit of the outcome of my purchase! Thank you very much Dave, you were a huge help! I wanted to leave a review today, because I'm a satisfied customer. I talked with CJ at Flexpetz about the different pet fence systems in length. He really helped me understand the differences, where prior to our conversation - I just figured they were all the same. The other systems seemed like they were also pretty good, but the best fit for me is just what I got. I really like the ability to recharge the collar as needed. Since this system only needs 2 hours to do a full charge, I locked onto it for me. CJ helped me to setup an order, and the system comes with free shipping. I really like this pro grade package, and the customer service that Flexpetz provides. They're now my 'go to' guys. When you have a lively dog, who likes to chase anything that moves, it's difficult to constantly keep an eye on him when he goes out. I don't want to make my neighbors upset anymore, and have to go over there to fetch the dog. The PetSafe rechargeable fence is just what someone in that situation needs. Believe me. Now I don't have that problem anymore. I can sit in the living room and watch the soaps, if I care to, and not have to worry about Hurley running up to the neighbor's screen door. Flexpetz is definitely skilled at putting a noob into the right fence system. I bought and installed this for my Parents because they are getting up there in age and have two small ankle biters that they can no longer take out as often for walks alone. They have a nice back yard and I have to say I am impressed with how well this works. They both do well on it and my parents are very happy with it. Now I am sure you ask since my parents are old, why this expensive system. I will tell you why. My parents live in the house they have lived in since they were married in and when they pass, the house is being passed to my son who is currently 16 years old. He is hoping to grow up in this house and keep it in the family. It is a beautiful home and honestly I believe this system may come in handy down the line as well. I like the PetSafe systems because you can buy almost any Petsafe collar and it will work with the transmitter, so no matter what kind of dog he ends up getting, he only needs to purchase a collar. So I feel that the quality purchase I made, made perfect sense with the family home that will also stay in place for may more years to come. I am impressed with the wonderful quality and service from this company and have actually been thinking of purchasing something for my home as well, even though i have a fence, but i have an open front yard and i like the many different layouts they show you on this site. Any I would recommend and it has really put my parents at ease. This was great choice. I very happy with system and I recommend for all people with any dogs. My dogs big and small and system work well for them. People are good talk too. Neighbor getting one and on the way. Will tell all about. Thank you. I am new to these types of invisible fences but after losing one of our best friends to an accident in the road we decided we needed to do something. There were too many options so I called for assistance and the people at flexpetz were very helpful. We have one min pin and a german shepard so would have never even thought to order different size collars for them. My only complaint is that the little dog collar is not rechargeable. I am one of those people that have a hard time keeping batteries stocked. Other than that the fence is working great. We will probably be back though for something to help with the little ones barking.